Despite Internet naysayers criticizing BDO World Champion Glen Durrant’s move to the PDC, saying it would expose him as unable to compete with the sport’s top players, Durrant has played brilliantly making finals in back to back pro tour weekends. https://www.dartconnect.com/wp-content/uploads/duzza1.jpg 600 800 Gregg Tong Gregg Tong2019-02-17 19:51:562019-02-17 19:53:43Glen Durrant: "there's no hiding place with DartConnect..."
DartConnect TV’s Free Fan Alerts provide fans around the world the perfect way to stay on top of their favorite player’s performances. As the service grows, it is starting to provide an indication of popularity and fan interest. 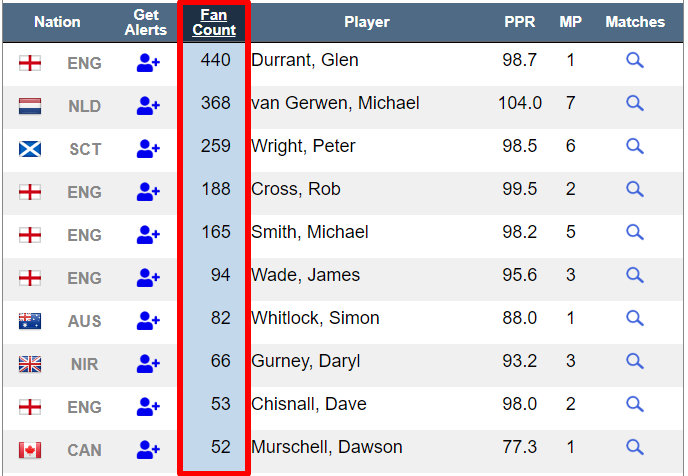 Check out the Top 10 PDC Players from last weekend’s Players Championship Event 1, based on dart fans signing up to follow them on DartConnect TV. The top position was not lost on the reigning BDO World Champion, Glen Durrant. 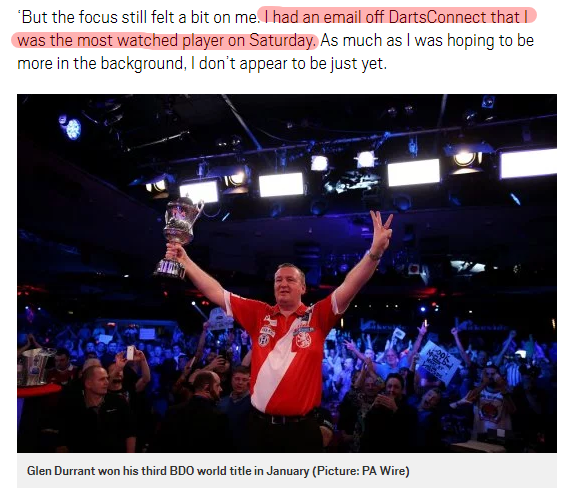 Hot on the heels of making the switch to play in the PDC, dart fans everywhere signed on to make sure they followed Durrant’s progress in his first attempt at the pro tour. Could he hold his own? Would he find himself outmatched? As the main man from what is considered the “minor leagues” of the BDO, he had much to prove that he belonged on the PDC stage. Durrant lost in the opening round of Event 1, but stormed back the next day to make the finals of Event 2, losing out to an in-form Dave Chisnall, #9 on the Fan Follow rankings. Want to follow Glen Durrant’s journey on the PDC Pro Tour? Sign up for FREE DCTV Fan Alerts and never miss a match!